Last night I upgraded my Juno-60 with the MDCB60 midi kit from D-tronics. Even though I prefer not to use midi, there are situations where midi is nice to have, for example when doing quick sketches that you want to save, or try different sounds without manually having to play the same sequence over and over. 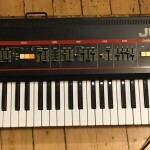 The Juno-60 was an upgraded version of the Juno-6, with the main difference that it had memory section, just like it’s main competitor Polysix. 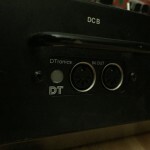 Another addition was the DCB port, which was Rolands predecessor to midi. Remember, this was back in 1982 and midi was first introduced in 1983. Before midi, Roland had DCB, Oberheim had it’s own proprietary protocol etc. Too my knowledge, only the Juno-60 and some of the Jupiter 8s had DCB . 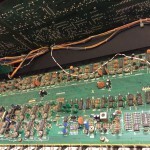 The JX-3P was the first Roland synth with midi, so DCB didn’t live more than a year or two. 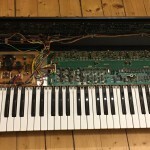 We should be thankful that the manufacturers actually managed to agree on the midi standard, that still lives 32 years later, even though it has its flaws. Luckily, DCB is quite primitive and therefore simple to convert to midi. The MDCB60 only adds note on/note off, so there’s no pitch bend, program change, arpeggiator sync etc. There’s a video here describing the installation, however, they seem to take the 5V power from another place than the gate pin. The installation took less than an hour in total, and it worked straight away! I recommend this kit if you need basic midi on your Juno-60. 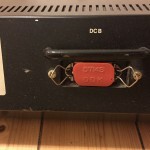 This is the DCB port, the original cover is still there. Looks quite clean, very little dust inside. 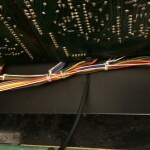 The DCB connector was desoldered and the purple and green wires were insulated according to the instruction manual. I had to cut one zip tie for the DCB connector and wires to reach outside the case. 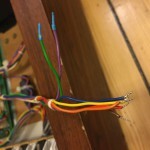 I added a new one so that the wiring is as original as possible. 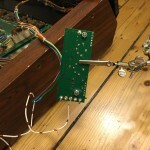 The remaining five wires from the DCB connector were soldered to the midi kit board instead. The white/red one is for 5V power and is soldered to the GATE 5V pin on the Juno-60 lower board. The MDC60 is mounted (upper left corner) and the wires are held by the new zip tie in it’s original position. The white/red wire takes power from the 5V GATE pin to the right. The backplate integrates very well and looks almost factory. The only visible trace of DCB is the screening above. I like! 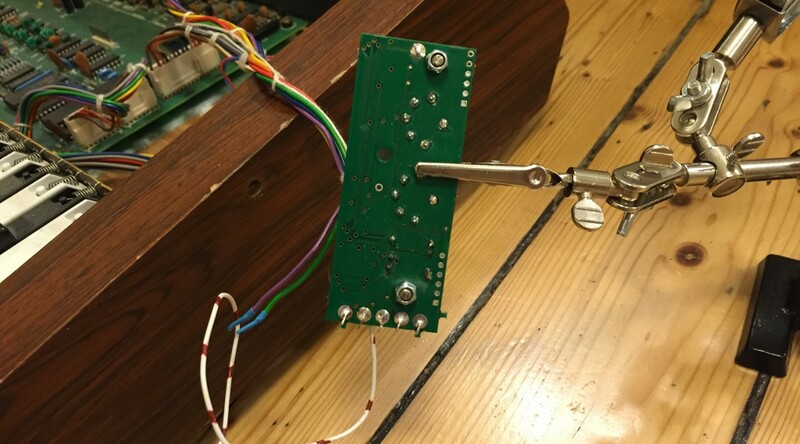 The button is a combined button/led which is used to set the midi channel, mine was set to channel 1 on default which is fine. The led also flashes on midi events.